Lights in the Sky | DISCLOSURE. NOW. Investigative journalist David Collins is the leading investigator and writer for KWBV Investigative Reports. David was embedded with coalition forces in the Operation Iraqi Freedom and Operation New Dawn, and has covered human interest stories since 1989. March 13, 1997 – Phoenix Arizona has had numerous UFO sightings over the past 150 years. 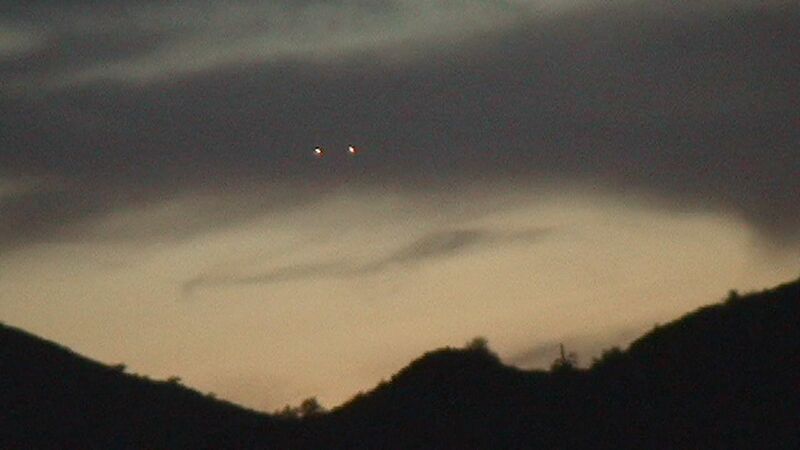 One of the most famous appearances was during the event known as the “Phoenix Lights”, where multiple unidentified objects, many of them described as “black triangles,” were spotted by the residents and videotaped by both the local media. Some lights drifted as low as 1000 feet and moved far too slowly for conventional aircraft and too silently for helicopters. Some of the lights appeared to group up in a giant “V” formation that lingered above the city for several minutes. Many residents reported one triangle to be over a mile wide that drifted slowly over their houses blocking out the stars of the night sky. Other reports indicated the craft were spotted flying away from Phoenix as far away as Las Vegas, Nevada and Los Angeles, California. The incident originated on March 13, 1997 near Henderson, Nevada and passed over the entire state to the edge of Tucson. The phenomenon was seen by over 30,000 people. The United States Air Force claims the formation of lights were flares dropped by A-10 Warthog aircraft, however eye-witness accounts claim the statewide sighting was unknown aircraft.